Finding a Father's Day gift for the dad who has everything can be daunting, but let your kids lead the way this year. Collect their words, create a wordle and frame it so he will remember how they see him all year long. A "wordle" is a graphic representation of a collection of words. You can build a wordle with any set of words and change the font, color and layout. All wordles you create are your property, and you can use them for anything you wish — even commercially! Wordles can be printed directly from the site or captured with a screenshot and resized with a program like PicMonkey. Asking children to describe their dad provides a unique look into the way they see the most important guy in their lives. If they are young and having a difficult time thinking of descriptive words, try a quick interview. My daughter, at five, is never at a loss for words, but my 3-year-old needed a little more prompting. I asked him about Daddy's favorite color, animal and his favorite things to do. Wordles are collections of words, and the size of each word is dependent on the frequency with which the word is typed in the text input section of the site. In order to combine words into phrases, use the ~ between words you'd like connected — we used it for "piggyback~rides." Visually, I wanted the words to be varied sizes, so I simply repeated certain words several times when I typed them into the wordle site. I used the "mostly horizontal" layout to get a roughly rectangular shape based on the canvas I planned to use for our finished product. Instead of printing and framing our wordle, the kids used Mod Podge to transfer it onto a decorated canvas — I purchased a multi-pack around Christmas. We used pieces of drawings the kids had around the house. They chose the pictures themselves with the understanding that some of them would be cut or covered in areas. Choose art to use on the perimeter of the canvas. Work with your kids to cut out the sections they want to include. 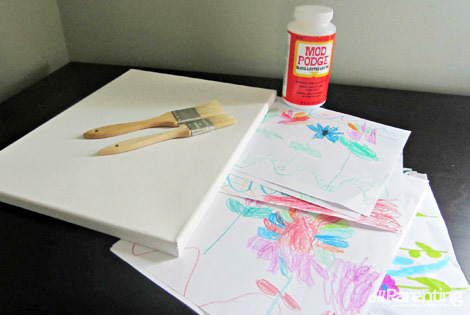 Use the sponge or brushes to paint Mod Podge onto the perimeter of the canvas. Place cut artwork onto canvas. 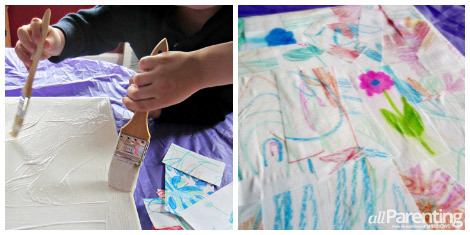 Remember pieces can overlap, though kids may want to work on their "own" sides so they're only covering their own pictures and not each other's drawings. 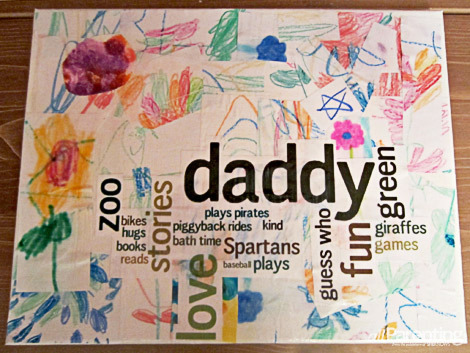 Place wordle on the canvas and cover all materials with even more Mod Podge. Be sure to help kids with the final coat to make sure all edges are covered.